This week, I don’t hear the chatter of kids as they walk to and from school. It’s Spring Break around here. I know many places have their breaks at different times, but here it has always been the week after Easter. I remember from my own school days that Easter break was fun, but not as much as Christmas break. We always had new outfits – remember my mom was a born designer! Most years we had bonnets or hats, too. We’d wear that outfit to church every Sunday until summer arrived. I loved those dresses and suits because they were made with love, and I had a say in color and style. The three of us were always lined up on the front lawn while my dad took photos. Those pictures still exist, but they’re packed away and stored at my daughter’s house. I have a good enough memory, though, that I can still see them in my mind’s eye. One that I remember was a suit (my sister had a matching one) that was gorgeous. It had a navy pleated skirt, a white blouse, and a small hound's tooth checked jacket in navy and gray. There was no collar, but the white blouse collar sat outside. I wore little white anklets and white patent Mary Jane shoes. My aunt found a white straw French navy hat, and I loved it with my suit. I’m not sure why that one stands out, but I can still see myself wearing it. Today, parents still dress up their little kids, but the older ones want no part of it. My daughter always gets adorable little outfits for the boys, and for the most part, they don’t fuss. This year the older one had navy slacks, a blue golf shirt, and a seersucker jacket. The younger one wore a blue and green plaid shirt with a pale tan linen blazer. They both had little straw hats, and while they were still, they looked fantastic. The week after Easter holds different memories for me. Sometimes we were at the shore if it was warm enough. My mother would be opening windows to air out the winter mustiness. We’d take walks on the beach, longing for the warm summer days. If we didn’t go to the shore, we’d be sneaking into our baskets for jelly beans and chocolate. Playing outdoors with friends took up most of the week. As a teacher, I knew that I had to squeeze in a lot between the break and the end of the year – spring was the worst time to hold kids’ attentions. This year, we had beautiful spring weather for a short time, but yesterday and today, it’s been cold and damp. Not much for kids to do in that kind of weather! My two little guys were supposed to be doing a lot this week, but they both got sick and need to stay home. So I must hold my memories of better times at Easter because this year, it’s been a bit of a bummer! You weave such beautiful memories, both of events already past and those occurring now. The latter will provide joyful moments in the years to come. I'm glad I'm able to keep memories. My poor mom lost that ability, and it's so sad. I remember TOO much sometimes! ooooo, i was hoping for pics!!! our neighborhood is quiet as well, no chatter and no noisy school buses!!!! Sorry. The camera was in the other room, and with my husband hobbling around, I didn't want to ask him to retrieve it. Next time! I enjoy hearing the kids, but with this weather, they're not even playing outside. Your post triggered memories of those pictures of the four of us kids standing in or Easter finery and holding baskets. 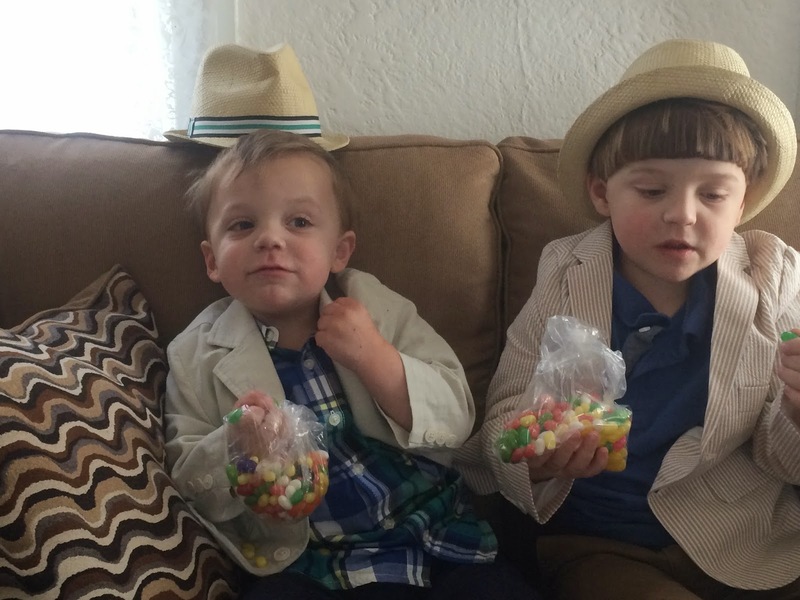 The younger of my two brothers always seem to have his complete attention on the candy in the basket. i'd like to burn those pictures because my mother always seemed to have the bright idea of giving me a home perm in the spring. It just now occurred to me to wonder why she did not torture my younger sister in that way. I think I'm fortunate in that my hair was curly and never needed a perm! I guess the days of kids dressing up for photos has passed. My daughter tries, but her two little monkeys are all over the place! The boys look so cute!